So, finally! Another great find from AMW! Imagine my delight when I got the Travalo Perfume Pods? I mean, where were you tiny bits from Heaven when I needed you most? Ever since I became a mom, I NEVER wear perfumes before going out, instead, I wear them whenever I'm in the car or when I'm out! Kyle Nash is a hugger, so I make sure I don't have anything too scented when I hug him before heading out of the door! So what do I have inside my bag? This ONE AND ONLY sample size scent from Michael Kors! The Michael Kors scent isn't bad! I LOVE it actually, but having to wear them EACH and EVERY TIME I go out, well, ahmm....is kinda boring! I used to change my scents DAILY! So imagine how hard it is for me to say loyal for just ONE scent just because I do not want to 'lug' all my full-sized perfumes whenever I go out? SO THIS IS INDEED A EUREKA MOMENT! Travalo, the brand, is originated in United Kingdom. These are perfect solutions for those who want to travel as light as possible! Now what's Travalo? Travalo is a new atomizer that comes with a patented Genie-S system that allows users to easily "pump to refill" their favorite scents. NO SPILLAGE or EXPOSURE TO AIR! I got 2 perfume pods, one for myself and another one for Mr. AMW! Mr. AMW owns this blue-capped Perfume Pod. While I get the red one of course! Just so you know, they also have other colors available for caps! Black, Blue, Gold, Pink, Purple, Hot Pink, Silver and Red! At the bottom is the patented Genie-S system and it is NO-brainer to use! One of the easiest and fastest way to refill your favorite scents! Here's how I would refill my favorite fragrance! Remove the small cap and place the bottom of the Perfume Pod directly on to the whole, pump and refill the pod until full. The aluminum case is lightweight and weighs barely anything! And the good thing is, it looks like a lipstick tube making it safe to tote around without spill! Mr. AMW's Perfume Pod with his favorite scent. 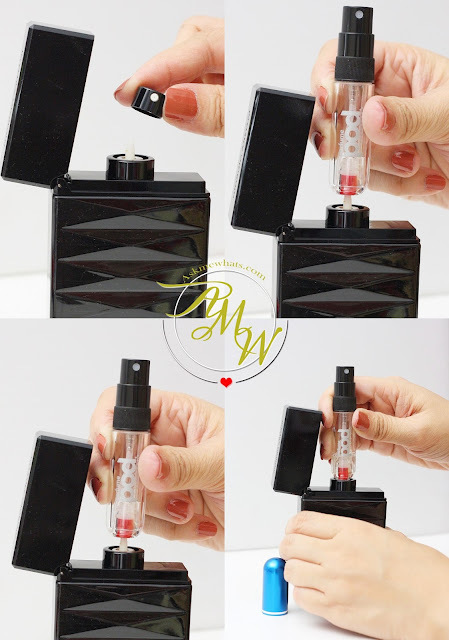 Now don't be deceived by the size of this Perfume Pod, a full refill can spritz upto 85x! Perfume Pods are available at the 2nd floor of Travalo SM North EDSA, Lazada Philippines and soon-to-open Travalo at SM Aura. I think this is one of my best find as of 2016! I can't wait to top this Eureka Moment! How do you like my Eureka Moment post? Any finds you can share to top this? I'd love to hear from you! I love travalo. Although I am not content with just atomizers since I also love to dab fragrances discreetly rather than spray so I also stock up on perfume vials so I can carry multiple fragrances with me all the time. ahhhh..I love these soo much! di ba sis? Siyempre I would understand, fellow mommy!